Whether your flat roof is fifty years old or five years old, material selection, weather, grade and installation are major factors on how it will hold up. 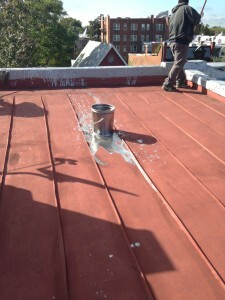 Modified and standing seam are slowly giving way to both EPDM and TPO. EPDM relies heavily on installation expertise, as it utilizes primers, and tapes that are highly influenced by temperature at installation. TPO is a welded system and less reliant on the many pieces required by EPDM. These are both fantastic products and both have unique advantages with flat roofs.